Eisners 2018: HOME TIME is on a roll! News | Eisners 2018: HOME TIME is on a roll! 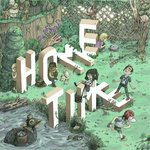 Campbell Whyte's debut graphic novel Home Time: Under the River placed another feather in its colorful cap today, as the Eisner committee of Comic-Con International announced it as a finalist for the Eisner Award in Best Publication for Kids (ages 9–12)! 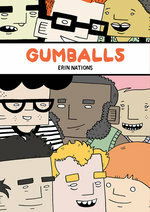 Earlier this month, Home Time received the DINKy Award for Best Work: Mid/Large Press at the Denver Independent Comics & Art Expo (DINK), where Erin Nations' Gumballs series also received the Outstanding Diversity Award. 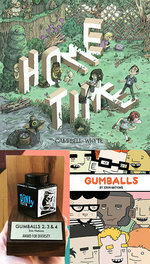 Home Time is also a finalist for such honors as the National Cartoonist Society Graphic Novel Award, Excellence in Graphic Literature Award, Readings Children's Book Prize, and Aurealis Award. Fans know that Campbell crafted the book around six main characters, famously using a different art style in each chapter to represent each one — and at this rate, he's on track to get an award for each kid! Congratulations to Campbell, Erin, and all the outstanding nominees.